I started using workstation in 2001, but the real work began in 2006 with GSX (now called VMware Server) and ESX. We had a lab full of software development and testing servers, out of Power, Space, & Cooling. We needed consolidation and test automation that included full OS re-installs multiple times daily, virtualization was the only solution. At the time I worked for a Microsoft gold partner we were pressured to use their solutions, but they were weak. VMware’s platform was/is robust and solid, we made the obvious decision. A year later we added Lab Manager to assist with the automation, now we use vCloud Director for the same functionality. I have spent a lot of time creating and implementing vSphere designs the past 7 years, this certification seemed like a worthy challenge. I began blogging about my IT experiences in 2008. I created a couple of popular posts, one of them about VMware Lab Manager best practices that gained a lot of traction in the community. I hoped VCDX certification would add to my credibility. I have had a current VCP since 2008. I really started considering VCDX and passed my VCAP4 exams in Sept & October of 2011. I then passed on my first paper/defence attempt in May of 2012 gaining VCDX4 certification. 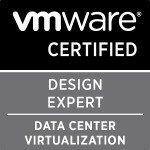 After passing the VCAP5-DCD exam I now have VCDX5 certification as well. It’s a very positive life changing experience, it will vault you into an impressive peer group that I doubt I will ever feel worthy of. Be sure to allocate plenty of time for preparation, know your design and be ready to explain why you made every decision you did and why you didn’t make the other choices. I have already been given more opportunities to work on bigger and more visible projects. I now enter any situation with more confidence and my ideas are worth a lot more than just another suggestion in the room. Meeting other VCDX candidates was a great experience; I have a few new friends and a lot of new career networking options. It was definitely worth it. The only change I would make is to have pursued it earlier. Categories: Certifications, VCAP, VCDX, Virtualisation | Tags: VCAP, VCDX, VCDX4, VCDX5, Virtualisation, virtualization | Permalink.